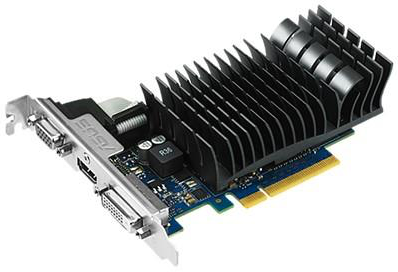 It was time to upgrade my secondary video card on my trusty MacPro3,1. I first goofed considerably with a Radeon 5250. I even went so far as to bust out my old firmware editing tools to change the vendor id in a feeble attempt to get OS X to use it without needing to modify kexts. Then I heard that more recent nvidia cards are supported by NVIDIA’s “web” OS X drivers. I swapped the 5250 (with its firmware restored) for a GeForce GT 720. I opted for the ASUS 2GB implementation of the GT 720. I’m a big fan of fanless heatsyncs. I initially booted with the nvidia card installed and none of my displays functioned. Then I removed the card, booted again and installed NVIDIA’s web drivers. Then everything worked great. The GT 720 is installed in the top PCIe slot, immediately below the Intel SSD. Here’s the card installed in my machine. 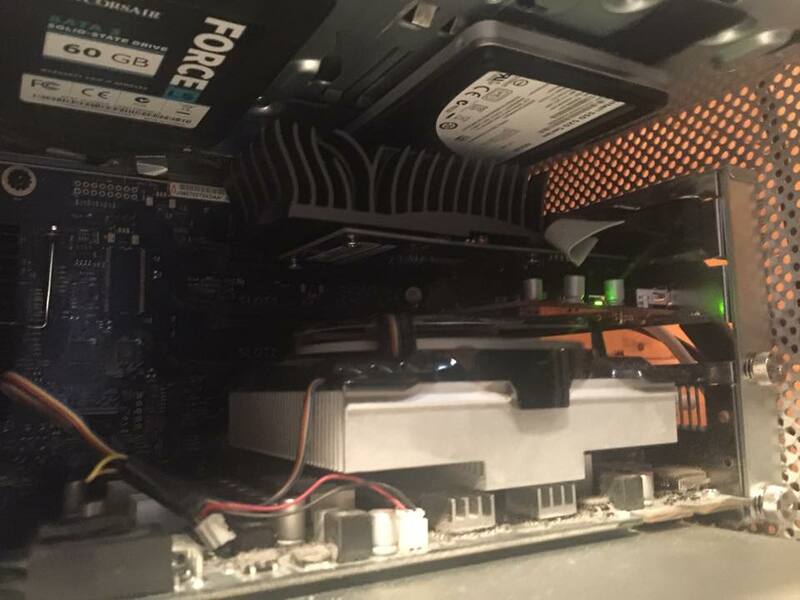 Note that by putting it in the top slot, I had to move my two 3.5″ drives to the forward bays and my SSDs to the rear, else the heat sync would have been a big problem. 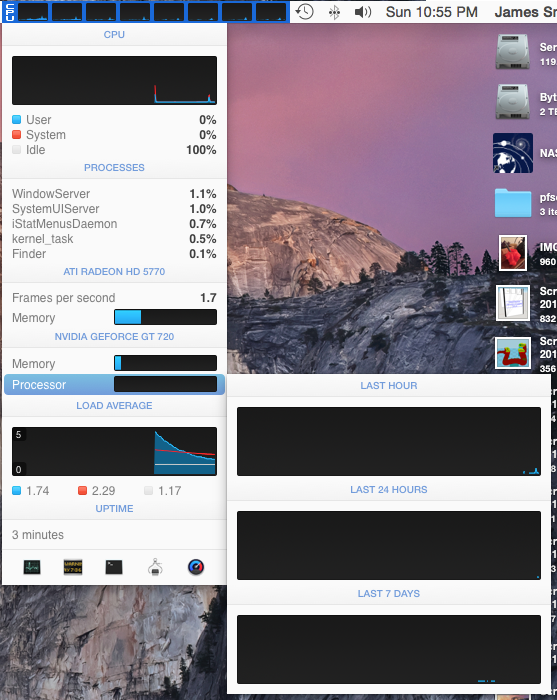 iStat Menus can even indicate to me not only memory consumption but GPU load on the GT 720. I’m pretty happy with this. Now my Mac Pro is very nearly totally silent. And my tiny office is much notably cooler. That freakin 2600XT was wearing on me far more than I knew, it was making everything sucky. This surprises me as it was only used for terminals and documentation. Nevertheless, it was clearly holding everything back. I had even enabled picture-in-picture zooming because the normal zoom was brutal since I upgraded to 10.10. Now I’m compelled to upgrade other aspects of this Mac Pro. I think the measly 10GB of RAM needs some attention!